Gege Crochet: Holy Julie Newmar Batman! I love cats. My family has always had cats for as long as I can remember. Granted, we also had dogs, birds, hamsters, chickens, ducks, fish, and even a pig. Actually- just a random factoid for ya- the fate of that pig is the reason why my sister is now a vegetarian.... Ahhh....nothing like country living. But I digress. If I wasn't married, I'd most likely be the crazy cat lady that lives down the street with fifteen cats roaming around my house and yard, muttering to myself all day long. Every now and then I do get the urge to channel Eartha Kitt (the only REAL Catwoman of color) and say, "You're purrrrfect darling," when I pass a mirror. Teehee! 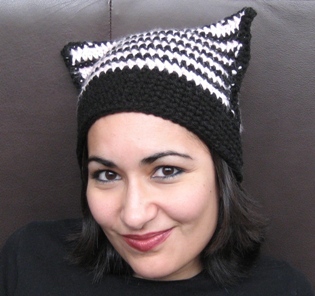 So, I've been wanting to make a cat-eared hat for the longest time; however, I never found a pattern that really called out to me. This all changed just a few days ago when I was looking at and petting my yarn stash (Oh, how do I love thee? Let me count the ways!) The preciousness that caught my attention was the glow-in-the dark yarn that I've had for a while but didn't have a clue what I should create with it. Inspiration came a-knockin' my friends. Most patterns I've seen seem to be a simple rectangle that is folded over and sewn together; however, the ears never seemed to be cat-like enough for my taste. 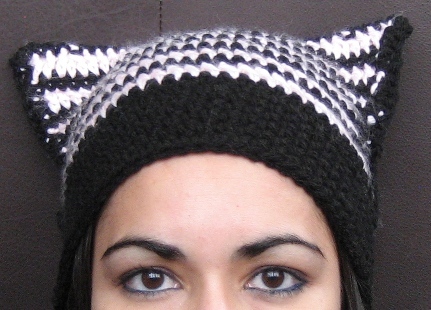 There are also some that are plain hats with crocheted ears sewn on at the end. I hate sewing things together and avoid it whenever I can. 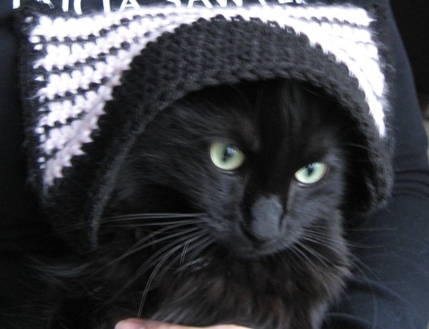 So, I got tinkering with some yarn and with an increase here and a decrease there, I was able to get a cat-eared hat that really worked for me. See! The points actually look like cat ears! WOOO ME! My sister's cat wanted in on my photo shoot, yet surprisingly didn't really enjoy being a model. Shame- he was such a natural. Although, I did get the point that he wanted out of his contract when he sliced my arm off- that darn cat. The best part? IT FREAKING GLOWS IN THE DARK! Muahahahaha! Another thing I've been working on is a purse inspired by my scarves. Yes, I do have a thing for watermelons. My bag isn't complete- I'm looking for fabric with which to line it. However, I am writing up the pattern for it and my dear friend has offered to test it out for me, so I'll hopefully have it available in the very near future. 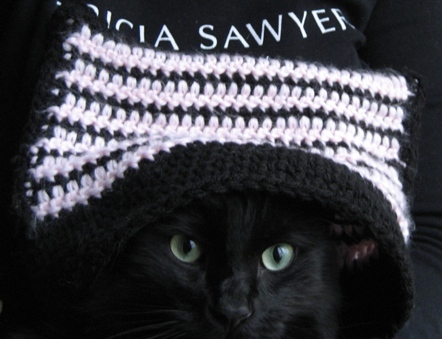 But, what I DO have is a pattern for my Cat Lady Hat!! It's not been tested, so if you do make it, please let me know if you find any mistakes. Enjoy! To change colors, work the last stitch until 2 loops are left on the hook, then pull the new color through to complete the stitch. I carried the unused color throughout the work to avoid weaving in ends. I hate weaving in ends. row 1: sc in second chain from hook. sc down row, changing color at end of row- 30 sc. row 3: Turn. with color A, ch 1, sc in same stitch, sc down row, changing color at end of row- 30 sc. row 14: Turn ch1. Sc dec in 1st and 2nd stitch. 1 sc next 2 stitches. 2 sc next stitch. sc in next 20 stitches. 2 sc next stitch. sc dec last 2 stitches, changing color at end of the row. row 15: Turn. With color B, chain 2. dc in next stitch. 1 dc next 2 stitches. 2 dc next stitch. dc in next 20 stitches. 2 dc next stitch. dc in next 2 stitches. dc decrease last 2 stitches, changing color at end of the row. row 16: with color A, ch 1. sc in same stitch and down row. Do not sc in chain 2 of previous row. Change color at end of row- 30 sc. Fold hat in half and sew together by sc up each side- 1 sc in each sc and 2 sc in each dc. Bottom band: Attach color A to any sc and sc around. Repeat 5 more times. Cut off yarn. Weave in ends. Aw, I so love your hat. Can you clarify some of them please? hi im just wondering, i am a newbie too and started to make this but i ended up with something like 37st?! and i had to unpick it all. sigh. it didnt look the right shape either. can you clarify this bit in row 15: 2 dc next stitch. Is that 2dc in one stitch? I dont know where im going wrong! Yes, "2dc next stitch" means to do 2 dc in the same stitch- it will make an increase in that stitch. In row 15, the initial ch2 does not count as a stitch- it is part of a dc-decrease. That is why the end of row 16 says, "Do not sc in chain 2 of previous row". Are you doing a dc-decrease at the end of row 15? At the end of each row, you should have 30 stitches. Can you find where you went to 31? If so, we may be able to find out what is going wrong. Let me know! Also- Zetsu- I just checked my email b/c your name seemed familiar. Turns out that I thought your comment was actually an email and replied to it....I just found out that it went to, "noreply-comment@blogger.com" I wondered why you never responded. Boy- do I feel like a dope. If you still read this, mea culpa! I am a bit confused. i am new at corcheting and this is one thing I want to do so bad! So, how do you start it? I know you start with a chain but how big? and yeah.. i dunno the instructions are so confusing to me. I made your hat! I had a little trouble around rows 13, 14 and 15, but all in all it was a really quick and easy pattern. And the effect is just awesome! I posted it on my DA account, giving a link back to this site and making sure they know that I just made the thing, not the pattern! Hope you check it out sometime! SWEET! Thanks Anon!! I really love seeing pics of FO resulting from my patterns. And, I LOVE your color choices!! Mind if I use your pic in a future blog post?? Et vous ? d'ou venez vous ? Ma compagne vient de copier votre modèle de chapeau pour faire des cadeaux de Noël aux enfants de ma famille. Bravo et merci. Thank you, Sasi! I'm glad you like it! I'm sorry I don't speak French- My Mister does, though, and he translated for me. :) While it may be possible that we are related somewhere down the line, "Crochet" is not my last name. Gege Crochet is just the name I chose for my blog. I hope the children loved their Christmas gifts!! I made this for a friend this month. I posted it on ravelry.com and linked back to your page. Thanks for a fun project! Heyy.. i only started crocheting a couple weeks ago but this pattern is my absolute favorite! :) i was looking all over for a kitty-kat. i made it in royal blue and gray and its fabulous and light weight for the summer. Thank you so much for the pattern! I speak spanish, and don't understand at well English... but I promise to make the hat and show you the result! could you please make one without the color changes? if you have better things to do (u probly do lol) then will it change if i just ignore the "with color B", etc., parts? 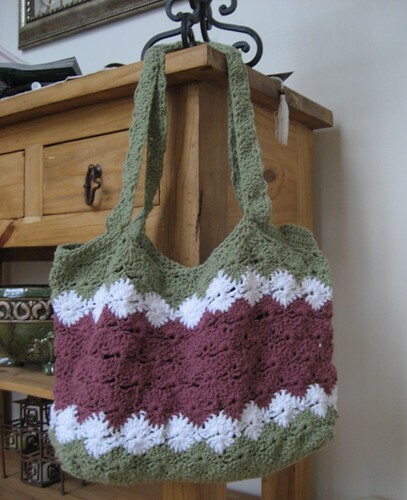 That's what I did, you can do that will all crochet patterns. also, do you think this would be ok for a beginner if i remove the color changes? Hey metoob! Sorry for the delay in response! If you haven't done so already, yes, you can absolutely use just one color and, yes, it is definitely a good pattern for beginners. :) Just simple stitches and a few increases/decreases. Let me know if you have any other questions! Is there a video of this hat somewhere? I've tried to make this hat about a dozen times and it keeps coming out wrong, and I'm following everything to the letter. Please help. Nice! What are the increases and decreases for if it just ends up being a rectangle? I'm in love and I don't care who knows it!